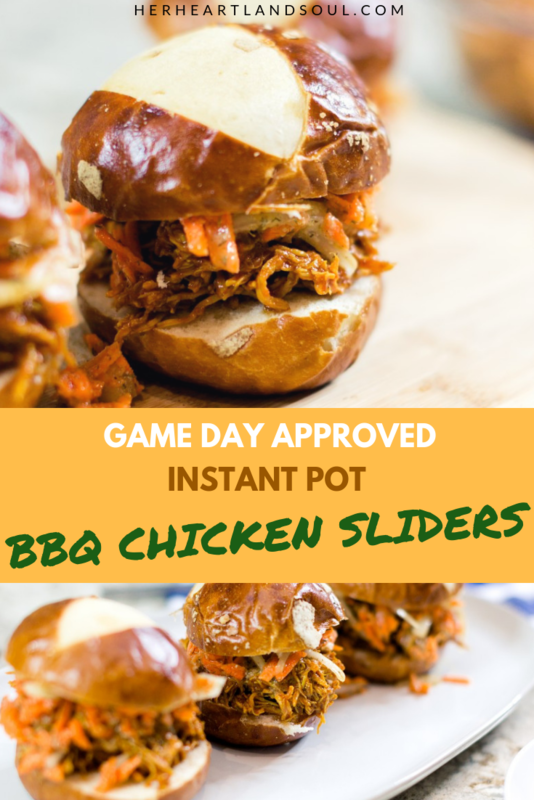 These BBQ chicken sliders are the perfect game day recipe. 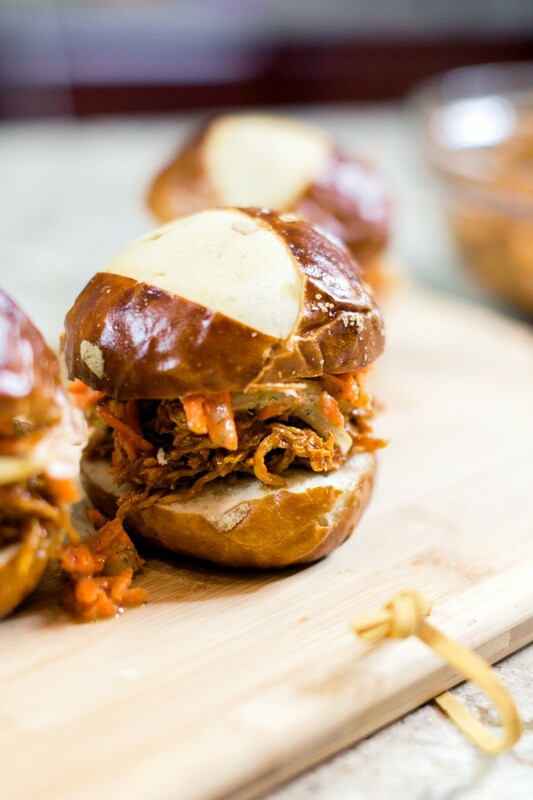 Pulled chicken is easy to make in the Instant Pot and tastes great with a carrot slaw and pretzel buns. We are deep in the middle of college football season and it is such a fun time to be in Nebraska. Even though this is a rebuilding year for the Huskers, Nebraska has so much pride in Husker football. I have been learning a ton about the sport and am having so much fun watching the games and cheering on the Huskers. One of the things that makes football games so fun is all the good food. I love having some yummy snacks to munch on while we watch the game. 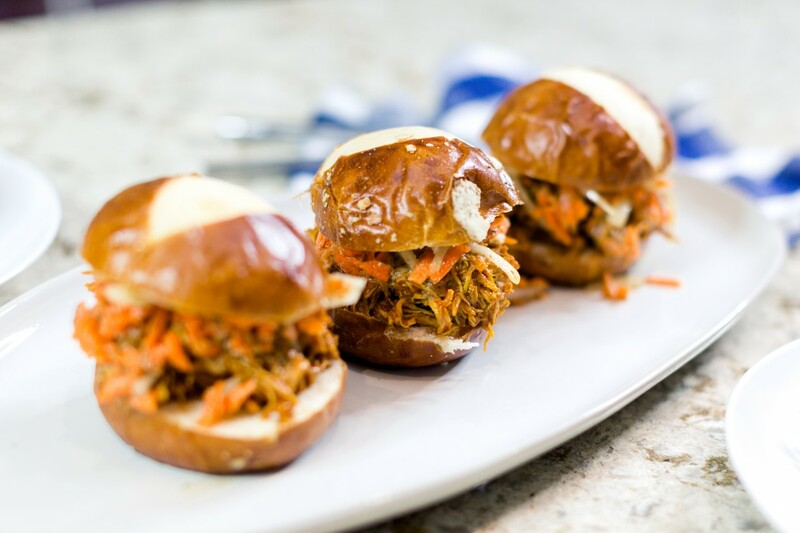 These BBQ chicken sliders are a true fan favorite. They’re so easy to make thanks to my handy dandy Instant Pot. You just set it and forget it and have a delicious meal in no time. We picked up all the slider ingredients at Family Fare. 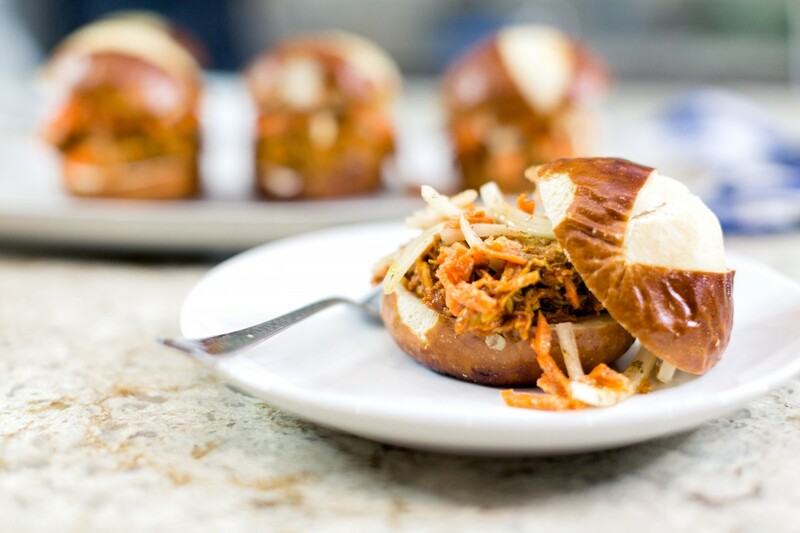 Everything tastes better when it’s on a pretzel bun, and a tangy slaw adds a fun kick to the BBQ chicken. A big thanks to Ashley for the fabulous photos and video in this post! Questions of the Day: Are you a football fan? Do you host game day parties at your house? 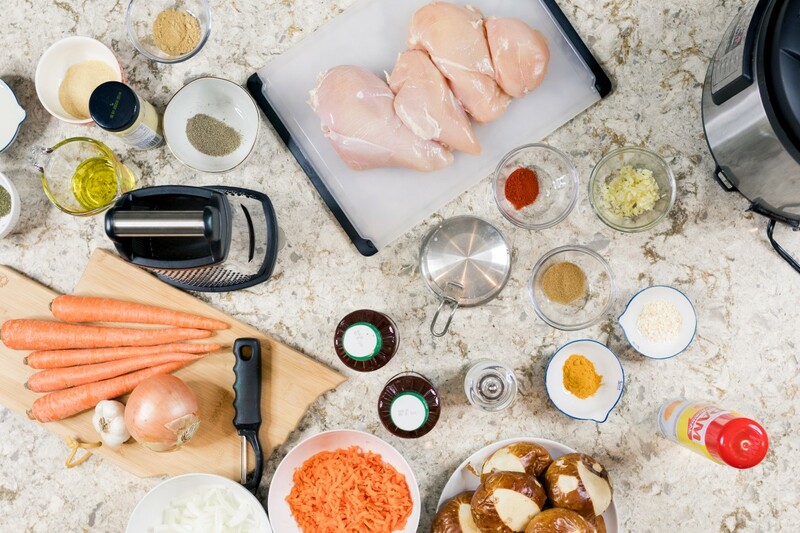 Are you an Instant Pot fan? Thanks to Family Fare for sponsoring this post! I shouldnt look at food blogs when I am hungry, this looks like its easy and tasty!! Ahhh, these look and sound amazing! I love pulled chicken, so I’m definitely gonna need to try making these soon! I need to get some pretzel slider buns! I haven’t had a slider in years!! Love that you used your instant pot. I’ll have to try this out 🙂 Looks so yummy, especially served on pretzels buns. Oh these look absolutely wonderful!! Love the slaw topping. Okay this really is a quick and easy meal. 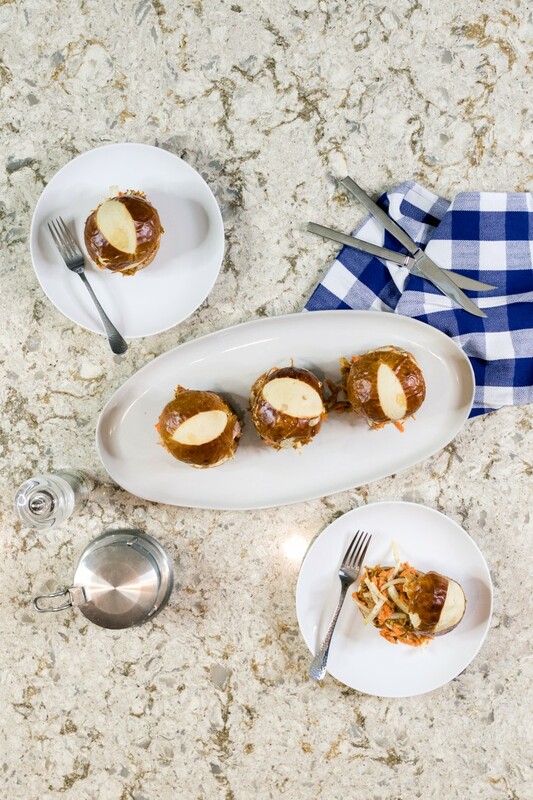 It looks delicious and would be perfect for lunch or dinner! It sounds delicious and looks like it, too. The carrot slaw might be a good thing for my kids to try. They love carrots. Wow do thes look tasty! And so many occasions they’d be perfect for this time of year! Yum! Great use for my Instant Pot! Oh my! These look so amazing! I can’t wait to try them tonight! Oh my gosh these look perfect for this time of year! It’s suddenly gotten freezing cold here in London so these could be just the thing I need! These look so yummy!! Thank you for sharing! I’ll have to try these! I’m pretty much obsessed with my instant pot. I use it most nights of the week because I get home so late and need to get a meal on the table. I love that you have ginger in the slaw recipe, I bet it adds a nice bite. I’ve never added ginger, gonna have to give this a go! Thanks for sharing. For some reason I never thought to do a pulled chicken in the instant pot. Glad to be adding new recipes to my arsenal. This looks amazing. I’m always looking to try new things with my Insta Pot. Can’t wait to try this! Oh my goodness, pretzel buns!! They are my husbands favorite. The only thing I can cook in my instant pot so far is shredded chicken so this would work. I think you got me with that carrot slaw! Stealing this for game day. We’re a Michigan Wolverines family! 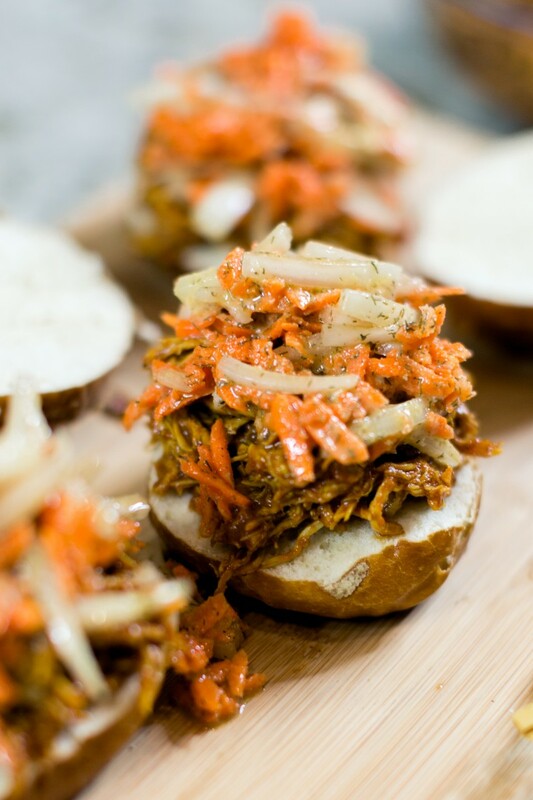 I love instant pot pulled chicken, but I would never have thought of carrot slaw to top them. It sounds amazing! Love the video. These look great and I like serving them on pretzel buns. These look delicious! I always make my pulled chicken in my crock pot. I’ll have to try it in my instant pot next time — and with that carrot slaw. This looks like to-die-for! My husband would absolutely love this on game days/nights!